String – Free – print of the targets from http://www.poweredbystring.com/files/String_Image_Targets.pdf and try them with the app. Some interesting graphics to begin experimenting with AR. Can also purchase the SDK to create your own. Konstruct – Free – sound reactive generative AR art app. 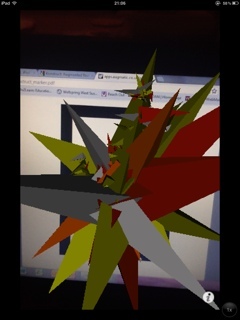 Point your device at the target (http://apps.augmatic.co.uk/pdf/Konstruct_marker.pdf) and play some music and watch the picture come to life. Aurasma Lite – Free – allows you to add your own visuals and music to any objects that you point the device at. Works well but need to make sure the object is in a stationary place and not going to be moved.